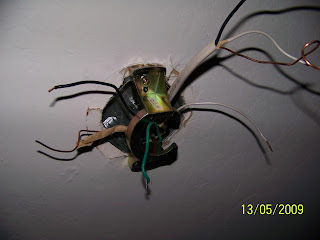 Question: I'm installing a ceiling fan and there are two groups of wires coming out of the outlet box. One is for the switch on the wall and the other is for the fan. How can I tell which one is for which? How can I test them? First you need an voltage tester. Electricians never leave home without a voltage tester. One wire will read 120 volts across the black and white. The black from that wire gets connected to the white from the other wire. You will be left wit a black and white wire. They simply get attached to the black and white wire of the fan. Some fans have a blue or red wire for a light kit. The light kit wire would go togethjer with the black wires. This Answer was very helpful. Thanks for clearing things up. Great article with a lot of valuable information! It covers a lot of very important information. Nice to know how to installing a ceiling fan !! I really recommend other to read this article .Keep up the good work .